YUPO 101: A Synthetic Paper is Born. The raw materials arrive by rail at our state-of-the-art facility and are loaded into their respective silos and hoppers for master batch mixing and eventual transformation into pellets. These pellets are then fed into our patented heating and extruding equipment. The base and surface layers are formed during the extruding process, and these three layers are stretched to create a dimensionally stable, biaxial-oriented substrate. The innumerable micro-voids created through this process give YUPO its incredible strength, opacity and ultra-smooth surface finish. 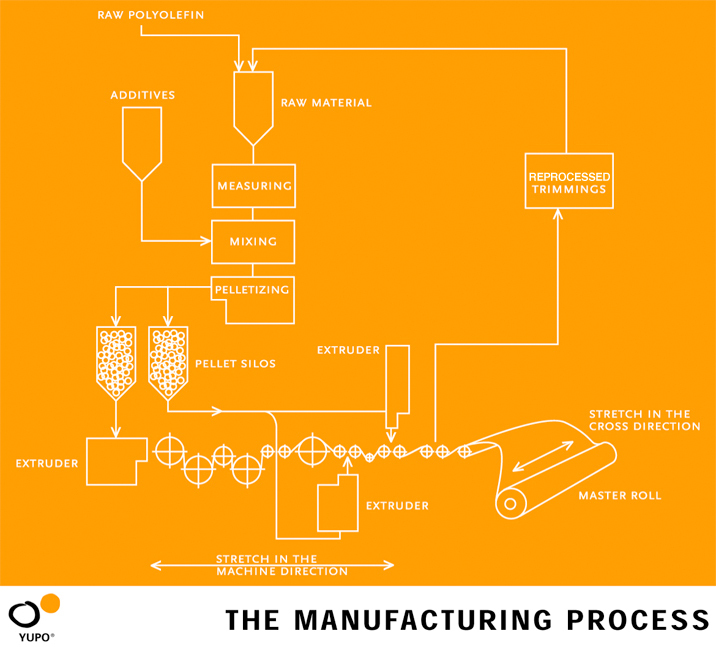 Every phase of the manufacturing process is computer controlled and closely monitored to ensure adherence to what many acknowledge to be the most stringent quality standards in the industry. Put that in your press and run it.